Halloween. The word conjures up masked figures and haunted houses, jack-o’-lanterns and witches flying on broomsticks. Now picture a vampire playing violin, a goblin playing cello, a ghost playing double bass — and you might be imagining how the Concordia Orchestra, will look this Halloween. “My stand partner and I are going to do something together. Maybe…Hansel and Gretel, or Little Red Riding Hood and the Wolf,” said Rebecca Kendall, a violinist in the orchestra. The orchestra is dressing up in costume for the first performance of their fall domestic tour, which falls on Halloween day. 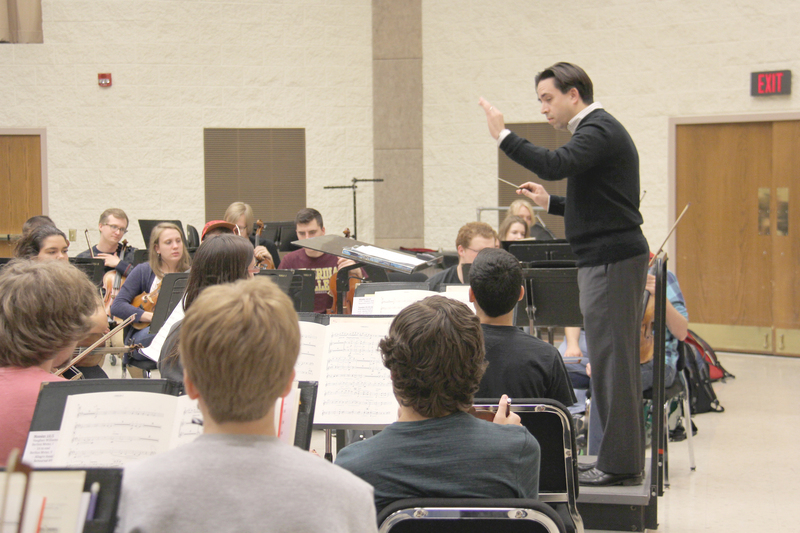 Orchestra conductor Foster Beyers directs one of their Halloween pieces. Photo by Reilly Myklebust. Last year Beyers promised the orchestra that, if there was a performance on Halloween again, they were going to do a Halloween concert in costume. “Since I’m asking [the orchestra] to miss Halloween day on campus once again, we want to do something kind of fun to … make up for the fact that they’re disappointed we have to miss Halloween. And I think that now they are excited about it,” Beyers said. The Concordia Orchestra’s fall domestic tour begins Oct. 31. The orchestra has eight performances over the eight day tour and will travel as far away as Colorado. “We’re really excited about tour. … Orchestra is playing better than ever. This is the strongest orchestra that I’ve had since I’ve been at Concordia, and this is my fifth year, so I’m really excited,” Beyers said. The excitement about the tour is shared by more than just the conductor. “[Touring is] the best part of the year. It’s so much fun,” said Annika Johnson, a violinist in the orchestra. But the tour is about more than just having fun. The orchestra’s first performance on tour will be in Le Mars, Iowa on Halloween. In past years, despite having performances on Halloween, the orchestra has not worn costumes. “We had a concert on Halloween, but it was just a normal concert,” Kendall said. Part of this is due to concerts not always being the appropriate place to wear Halloween costumes. “Often we are either doing a concert on Halloween but it’s not really appropriate to do it in costume, because it’s not really a Halloween concert, or we just don’t do a concert on Halloween because it’s hard to get an audience on Halloween,” Beyers said. Last year’s Halloween performance was on a Friday and the audience was smaller than normal, according to Beyers. 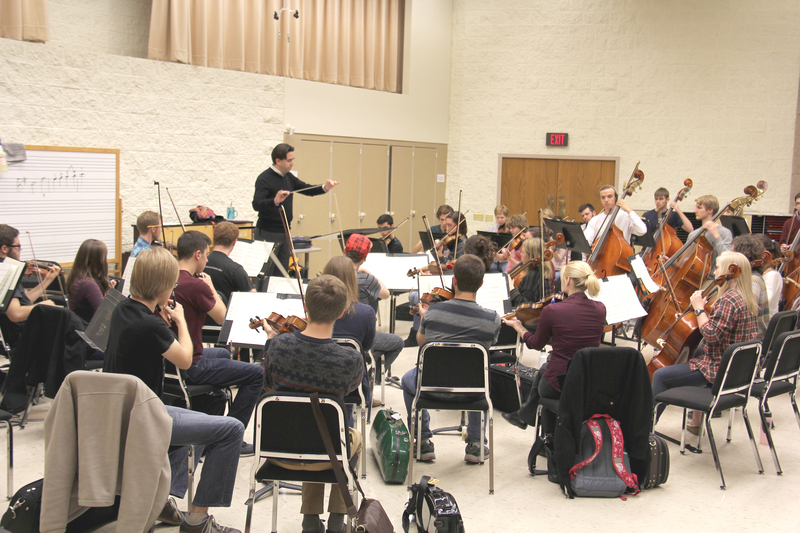 This year, the orchestra is hoping to draw a bigger crowd to its Halloween performance by wearing costumes. Foster Beyers and the Concordia Orchestra run through “Symphonie Fantastique.” Photo by Reilly Myklebust. Students can be as creative as they want with their costumes, but there are limits to what they can wear. Whether this advice will be heeded or not is another story. “My friend Mike Miller wants to go as a box, but I’m not really sure how that’s going to work, because he plays violin,” Johnson said. Another of Johnson’s friends plans on going as Princess Leia from “Star Wars.” Despite these lively costumes, most students seem well aware of the restrictions, according to Johnson. The music that the orchestra is performing also lends itself to the Halloween theme. Berlioz’s “Symphonie Fantastique” is purposely scary, according to Beyers. “It’s perfect for a Halloween concert,” Beyers said. 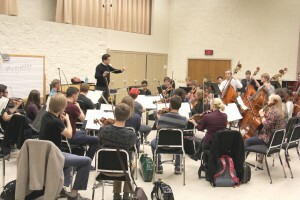 Whether or not the orchestra will dress up for a Halloween concert again next year is still unknown, but Johnson is optimistic about the prospect. Beyers also seems like he would be willing to have a costume concert again next year if the tour performs on Halloween.